DVI KVM over IP extends DVI, USB, 2-way analog audio, RS-232, and IR, over a Gigabit Local Area Network. Resolutions up to 1080p Full HD and 1920 x 1200 (WUXGA) are supported. HDMI digital audio is also supported when using HDMI sources and displays with HDMI to DVI adaptors. 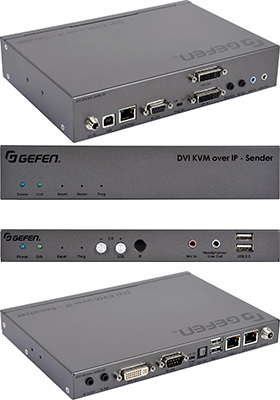 The Sender and Receiver units can be automatically or manually configured to unique IP addresses to allow the connection of multiple Senders and Receivers to the same network. Multiple Receiver units can simultaneously connect to any Sender unit within the network to create a virtual crosspoint matrix of up to 16 Senders and multiple Receivers up to a theoretical limit of just over 65,000 units, depending on the network bandwidth and number of ports of the network switch. Each Receiver unit has a built in Ethernet switch and two additional RJ-45 Ethernet ports to allow for the connection of computers and other IP-enabled devices. Each Receiver unit allows the connection of two USB devices with up to 500mA current draw per port, providing access to keyboard, mouse, printers, scanners and cameras. Bi-directional analog audio capability allows audio to be transported between the Sender and the Receiver units. Built-in mic pre-amp on the Receiver unit ensures compatibility with a variety of microphones. Infrared (IR) commands from the Receiver side can be extended to sources located by any of the Senders. DVI KVM over IP is perfect for large scale remote workstation access, and for digital signage applications. 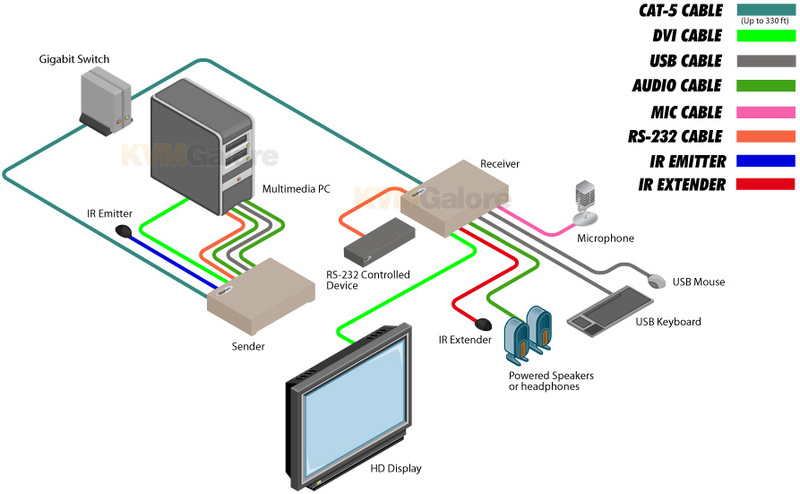 Note: Even though these devices use DVI connectors – they will also pass integrated HDMI audio through the DVI connectors, simply by using DVI-HDMI cables (or DVI-HDMI adapters) to connect to your computers and user-consoles.